Education Department. 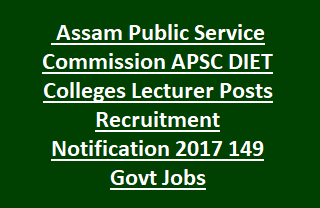 There are total 149 vacancies in this DIET Colleges Lecturer Jobs in Assam PSC recruitment 2017. Selection for DIET Colleges Lecturer Jobs recruitment of APSC will be held based through merit in qualifying exam or objective written/screening test or personal interview. These vacancies are only for the DIET Institutions for teaching the candidates who are getting trained to become an Elementary School Teachers. Last date for application form submission offline to APSC for this DIET Colleges Lecturer jobs is 26-12-2017. More details about this Assam PSC recruitment of DIET Colleges Lecturer jobs vacancies are given below. Last Date to reach application form to APSC Commission office is 26-12-2017. There are total 149 vacancies available in DIET Colleges of Assam State Elementary Education Department. Lower age limit for all the posts is 21 years and upper age limit is 38 years as on 01-01-2017 and for SC/ST candidates 5 years of upper age relaxation is given. For all the Lecturer posts candidates must have qualified PG in respective subject with 55% of marks an M.Ed with 55% or its equivalent qualification. Candidates who are qualified Ph.D and M.Phil they are eligible to apply. Weightage will be given to the candidates who are having At least 3 years experience of teaching in any Govt. recognized Educational Institution/Govt./Aided School or College or Working experience in SCERT/Teacher Education Institutes/SSA/RMSA. (ii)Degree/Diploma in Education. If a large number of applications received then candidates will be shortlisted based on academic marks and/or objective type written test or screening test. Written test will be objective type only. Shortlisted candidates will be called for Demo or certificate verification or interview on due course. Candidates who having the necessary qualifications they can apply for this vacancies on or before 26-12-2017. Application form is available in official website of apsc.nic.in. Along with application form candidates have to submit all supporting documents to APSC before the closing date. On cover letter mention clearly for which post you are applying.